Bubba Avery had just arrived in Alaska, a 29-year-old journeyman lineman, when he discovered he was a poet. He’d just finished a job in Wyoming. Being a tramp lineman, when the work went north he went north too. That was 1980. 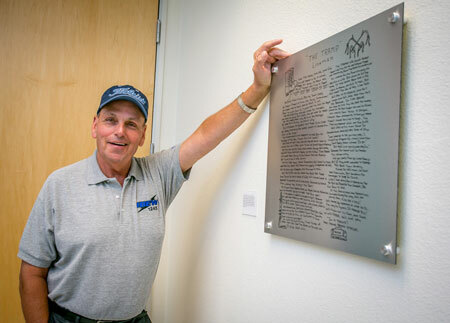 Three decades later, Bubba Avery’s poem “The Tramp Lineman” is framed and occupies a place of honor on the wall of the IBEW 1245 Dispatch Office in Vacaville, where tramp linemen can still be found looking for that next job. Avery’s poem never caught the attention of the Times Literary Supplement or Poetry Magazine, but it won quite a following among linemen who appreciated what it had to say about their lives. Avery copyrighted the poem and started a business called Trampline Enterprises. He began offering framed copies of the poem for sale. Today the poem can be found in union halls in Washington, Oregon, Texas, Oklahoma, New Mexico, and Arizona. Later, trying to work in Houston, a contractor told him he had to be in the union if he wanted to work. Sticking with the union was a no-brainer. Safety was another big issue for him. “When I first started the life expectancy of a contract lineman was about 7 years without being burned or killed. It was a pretty dangerous trade. Still is, but it was really bad back then,” he said. Avery was initiated into the IBEW in 1973, working out of Local 66 in Houston. Eventually he wound up with IBEW 1245, where he won election as secretary of the Outside Unit and was later recruited to run for the Outside seat on the Advisory Council. He’s not an attention-seeking sort of guy, but he thought it was important to do his part for the union. Next time you visit Vacaville, come on into the Dispatch Office, just inside the main entrance to Weakley Hall, and check out the “Tramp Lineman” for yourself.